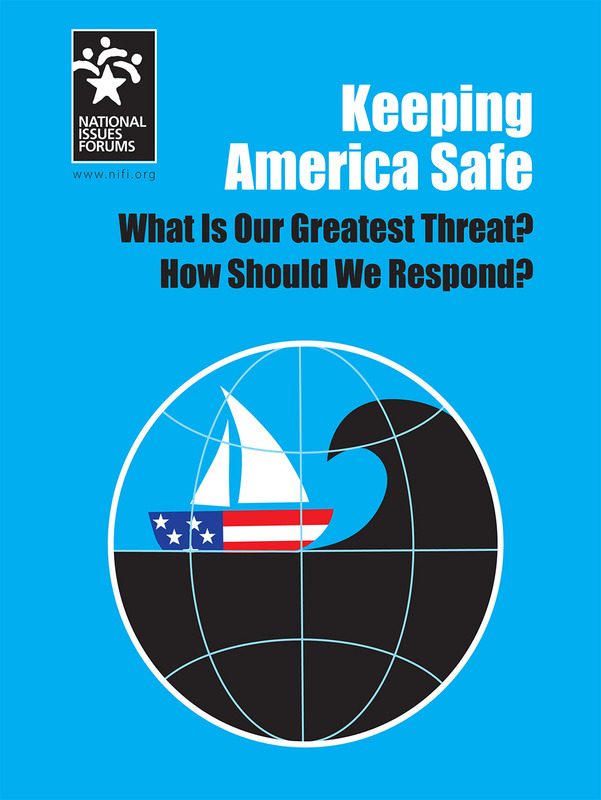 New Issue Guide - "Keeping America Safe: What is Our Greatest Threat? How Should We Respond?" This 23-page issue guide offers a framework for deliberating over the priorities that should inform our nation’s role on the world’s stage. It presents three different options for moving forward—each based on a different way of looking at our greatest threats and each involving a different set of prescriptions for what should be done. Most important, each option has significant downsides and drawbacks. Each of these will need to be considered if we are to decide how best to use our economic, military, and diplomatic resources. This option says the United States has focused too much on policing and protecting the world and not enough on shoring up its own prosperity and taking care of its own people. It is time to put our country’s needs first. The United States spends billions on defense and foreign aid while, at home, bridges and highways are crumbling, students face mountains of debt, and people go bankrupt trying to pay their medical bills. It is time to prioritize our own country’s needs. This option says that the United States cannot afford to ignore what’s happening outside our borders—we need to remain the world’s strongest power. Russia and China are flexing their military and economic muscles. North Korea has tested missiles and nuclear weapons. Americans fear foreign terrorist attacks both at home and abroad. Even our robust economy is threatened by unfair trade practices, and our democracy is put at risk by outside election meddling. Investing in being the world’s dominant power helps ensure stability in a dangerous world—and protects our freedom and prosperity by fighting threats at their source rather than on our shores. Given the varied and complex dangers we face today, this option says that our biggest threat is assuming that the United States can go it alone—whether by isolating ourselves or acting unilaterally. Today’s global challenges include migration, refugees, cyberterrorism, and more. Deadly new infectious diseases and the effects of climate change remind us that the natural world poses its own threats that don’t respect borders. By emphasizing diplomacy and building alliances, we can better solve complex crises and head off future ones. In the long run, promoting democracy and human rights makes the world both safer and more prosperous. Click here to read more and for link to download the materials.